The first leg of USA tour has been awesome! First stop Las Vegas with shows and teaching at the Focus on Street Magic scheduled for that very weekend we arrive. 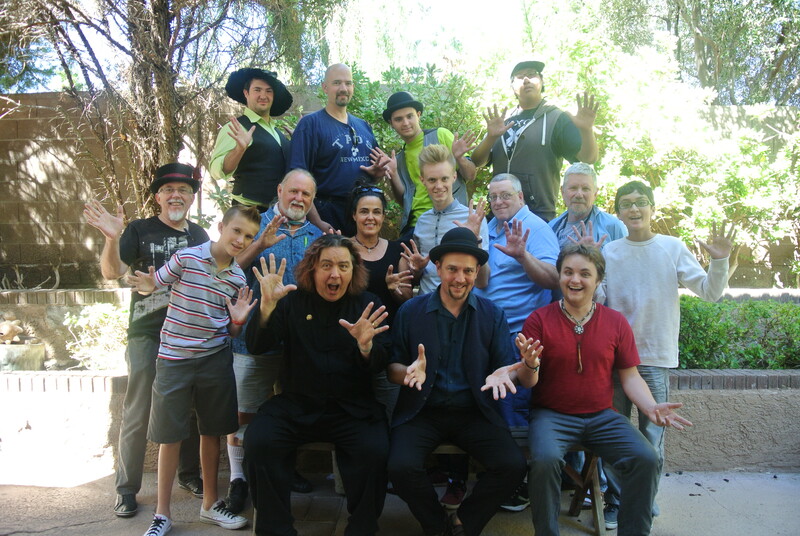 We are picked up by our good friend Jeff McBride who sweeps us off to the Magic and Mystery School – the home of both Abbi and Jeff – for a true Las Vegas welcome. Over the next day or two, we pull together the final details before the students descend for yet another sold out class. The one thing I have grown to anticipate is despite the fact this was now the fifth time we have run this weekend, each time we do so the class is unique, constantly evolving and changing. The School just keeps on getting better and better. This year was no exception to that rule. First of all – we have a great team – Jeff and Abbi McBride, Veronica Morris, Will Bradshaw, Grndle, Adam Flowers, Tim Wise and of course myself and we also have the broader team as well. Together Jeff and I deliver the bulk of the teaching covering every aspect of street performing, theory, practical advice, lots of skill building and effects being learned. This is all before we even hit the street for real hands on street time and street performing sessions that lead to feed back. The students arrive promptly at 10 am on Friday. The arrival is a great joy to witness. If you have never been to the House of Magic and Mystery you soon discover why its called so. With so many interesting things to look at, masks on every wall, awards and certificates, books of wonder and so many mysteries yet to revealed themselves you find yourself in total awe. Then together with our team, I am greeting the students as we welcome them in. A short time passes and we begin with a full magic show – Jeff McBride opens, Will Bradshaw is next up and I close the show with my international award winning street show. The ice has now been broken and the students are settling in well. As the weekend passes friendships are forged for life. Over ten of the students perform their shows on the Las Vegas strip. In addition, the students watch Grndle – a Local Las Vegas performer, Will Bradshaw and The Mario Morris Street Show. Jeff McBride hosts a truly amazing weekend. There are a few students that are still building up their experience before they feel ready to launch themselves into the deep end of street theater yet they are providing excellent support while learning incredible insights, skills and experiences. By the time the weekend is drawing to a close the comradeship that has been built is unforgettable and without any doubt in my mind confirmed by every student feed back that has attended the Focus on Street Magic Las Vegas that the weekend has been a life changing experience to all – including my self. Next time on our USA Trip you will read about Veronica and I flying to the East coast to perform and Teach in NY. Spending one on one time with one of last year students. Veronica and I perform street shows in the mountain area as well as delivering The Magic of Mario Morris show in a Theatre with a local Magician.